Anza Borrego Desert State Park © Marc Hoshovsky, California Dept. of Fish and Game. Like the Modoc Bioregion in northeast California, the Desert Bioregion has more in common ecologically with arid places to the south and east than to the greener regions to the north and west. The urbanization of the western part of the Desert bioregion, including the cities of Los Angeles and San Diego, has resulted in the alteration and destruction of habitat and proliferation of non-native species. Most species of the ubiquitous palm tree, in fact, are not native to California! Habitat in the western Desert varies widely, from chaparral, pinyon-juniper woodland, and grassland at lower elevations to mixed hardwood forest, southern oak, southern Jeffrey pine and southern yellow pine at higher levels. Along the coast, highly valued as prime real estate, development has replaced once-plentiful salt marshes and lagoons. The botanically complex eastern Desert features dramatic desert scenery. 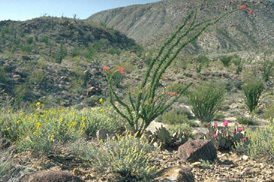 Common types of habitat are desert wash, Mojave creosote bush, scattered desert saltbush, Joshua tree scrub, alkali scrub, California fan palm oasis, pinyon-juniper woodland and some hardwood and conifer forests at higher elevations. Rare plants: San Diego barrel cactus, Plummer’s mariposa lily, mountain springs bush lupine, Laguna Mountains jewelflower, San Jacinto prickly phlox, Mt. Gleason Indian paintbrush, Orcutt’s woody aster, Orocopia sage, foxtail cactus, Coachella Valley milk vetch, crown of thorns, white bear poppy, Barstow woolly sunflower, alkali mariposa lily, Red Rock poppy, Mojave monkeyflower and Stephen’s beardtongue. Threatened and endangered plants: Conejo buckwheat, Otay tarplant. The western part of the Desert bioregion experiences hot, dry summers with wildfires. These are followed by wet winters with storms that can cause mudslides on fire-stripped slopes. The central Desert is agriculturally rich. 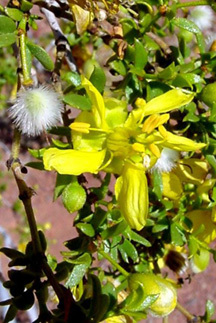 This semi-arid but heavily irrigated region experiences hot, dry summers and cool, damp winters. In the eastern Desert, the summers are hot and dry and the winters are cool to cold depending on elevation. Occasional winter rainstorms in the region can turn into flash floods. Desert fan palm. Charles Webber © California Academy of Sciences. The western part of the Desert bioregion is a study in contrasts– ocean and desert, flatlands and mountains. Major rivers that flow through the region are the Santa Clara, Los Angeles, Santa Ana, San Gabriel, San Luis Rey, San Jacinto, Santa Margarita, and San Diego. There are three national forests– the Angeles, Cleveland and San Bernardino. The central part of the bioregion is the Colorado Desert. This is the western extension of the Sonoran Desert, which covers southern Arizona and northwestern Mexico. Much of the land is less than 1,000 feet in elevation, and mountain peaks usually are lower than 3,000 feet. The Colorado River flows through here on its way to Yuma, Arizona. The New River, the most polluted river in the state, also runs through the region, flowing northward from Mexicali, Mexico, through the city of Calexico, California, into the Imperial Valley. Anza Borrego Desert State Park covers 600,000 acres and features more than 225 species of bird and dozens of mammals, amphibians, and reptiles. In the eastern part of the bioregion lies the Mojave Desert, the western extension of a vast desert that covers southern Nevada, the southwestern tip of Utah, and 25 million acres of Southern California, or one-quarter of the state. Historically, this area has been lightly populated, but urban congestion and housing costs are rapidly bringing more people into the eastern Desert. The landscape is mostly moderately high plateau with elevations averaging 2,000 to 3,000 feet. The Mojave, Amargosa and Colorado rivers are the largest rivers. 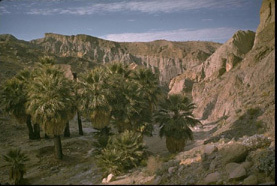 Palm oases (of native fan palm, shorter and bushier than its non-native cousins), streams and springs provide water for wildlife. In prehistoric times, the eastern Desert had great desert lakes; they have since evaporated and seeped underground. This part of the desert has the lowest elevation in North America– 282 feet below sea level at Badwater in Death Valley National Park. In addition to Death Valley, the region hosts two other national parks: East Mojave and Joshua Tree. 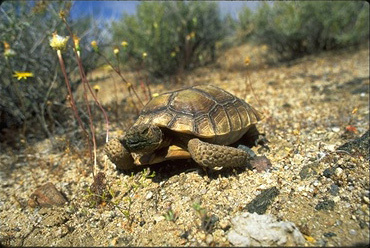 Desert tortoise. Gerald and Buff Corsi © California Academy of Sciences. The western part of the bioregion is home to mountain lions, coyotes, badgers, grey foxes, kit foxes, black bears, raccoons, mule deer, dolphins, whales, California sea lions, hawks, herons, golden eagles, ospreys, peregrine falcons and desert iguanas. In the central Desert, migratory cormorants, mergansers and white pelicans can be found. The rugged backcountry is the habitat of feral burros, golden eagles and nesting prairie falcons. The Salton Sea National Wildlife Refuge attracts such birds as great roadrunners, Gambel’s quail, Albert’s towhees, egrets, northern pintails, Canada geese, snow geese, rough-legged hawks, peregrine falcons, terns, yellow-headed blackbirds, hooded orioles and white-faced ibises. Dos Palmas Preserve, near Indio, is a desert oasis with a restored wetlands that accommodates endangered desert pupfish. The preserve attracts a variety of wildlife, such as hooded orioles, warblers, snowy egrets, ospreys, American avocets and horned lizards. Additionally, species in this part of the bioregion include Yuma antelope, ground squirrels, white-winged doves, muskrats, southern mule deer, coyotes, bobcats, and raccoons, flat-tailed horned lizard, prairie falcon, Andrew’s dune scarab beetle, Coachella Valley fringe-toed lizard, Le Conte’s thrasher, black-tailed gnatcatcher and California leaf-nosed bat. 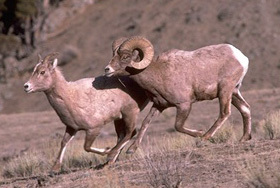 Bighorn sheep. Gerald and Buff Corsi © California Academy of Sciences. The eastern Desert region provides habitat for bird species such as snowy plovers, least sandpipers, killdeer, teal, thousands of migratory wading shore birds, as well as eagles, harriers, falcons and owls. Coyotes, badgers, great blue herons, red-tailed hawks, Canada geese, monarch butterfly, San Diego horned lizard, orange-throated whiptail, arroyo southwestern toad and Tehachapi pocket mouse also make their home here. Rare species: Prairie falcon, Le Conte’s thrasher, gray vireo, Nelson’s bighorn sheep, pale big-eared bat, Mohave tui chub and the cottontail marsh pupfish, found only in Death Valley National Park. Threatened and endangered species: California condor, Yuma clapper rail, California gnatcatcher, bald eagles, snowy plover, desert pupfish, Mojave ground squirrel, desert tortoise, Amargosa vole, Brown pelicans, California least tern, least Bell’s vireo, Belding’s savanna sparrow, Stephen’s kangaroo rat, Peninsula bighorn sheep, Santa Ana sucker. Smog–The western Desert, which encompasses Los Angeles and the highly urbanized surrounding area, often experiences pervasive or intense smog. Off-road vehicles– The Desert bioregion represents the most intact of the wildlands under the care of the federal Bureau of Land Management. San Bernardino County, however, has plans to gouge roads into the Mojave National Park and Preserve, mostly at the behest of dirt bikers and other off-road vehicle interests. These damaging activities have driven the desert tortoise to near extinction.